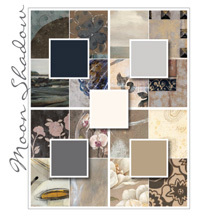 Moon Shadow provides a distinctly sophisticated masculine palette. Often Mood Shadow is accented with metallic undertones and a color range from neutral black and grey to warm grey and taupe. Look for modern silhouette patterns within the color palette along with traditional floral elements in smart modern backgrounds. Gango Editions ColourSheen truly shines in the Moon Shadow palette, showing off both the metallic base and the rich colors. This palette instantly brings confidence and wealth to any design.